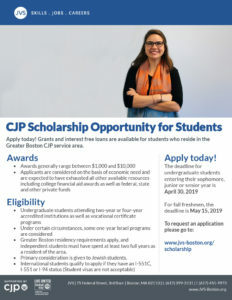 BOSTON, MA, March 14, 2019 – The Combined Jewish Philanthropies Scholarship Committee is now accepting applications for financial aid for the 2019-2020 academic year. The Committee awards financial assistance to financially needy undergraduate students whose permanent address is in a CJP service community. Aid is in the form of a grant or an interest-free loan. The average award is $4000-4800. Awards are based on documented financial need. The deadline for applications is April 30, 2019 for upperclassmen and May 15, 2019 for fall 2019 freshman. CJP is at the heart of Greater Boston’s Jewish community, but our reach is felt around the world. 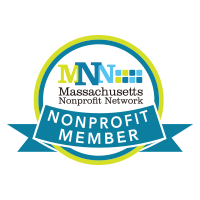 We bring together the resources, volunteers, leadership and expertise in Greater Boston to care for people in need, advocate for Israel and ensure a vibrant Jewish future. Together, we’re helping struggling families make ends meet, revitalizing Jewish education, building housing for the elderly and so much more.